A C. tominiensis in N. Sulawesi. Would it be possible to house two white tail Bristletooth tangs in one aquarium? The tank is a pretty large 220 gallon. I've never kept this species of tang before so don't know if they are compatible even though they are peaceful in temperament. 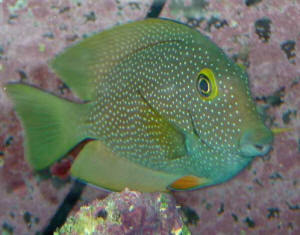 These will be the only tangs in the tank, there is a few other types of fish also. Would they be ok housed in a 150 gallon long tank? That is my upstairs aquarium and prefer to house them there instead of the basement 220. Sorry I don't understand? Is that a no? 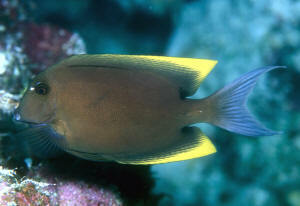 (Whitetail Tang). If I would add both of these at the same time , would they get along? I would be sure both were small in size when added. If these two Ctenochaetus would not get along are there any two Ctenochaetus that my 168 gallon tank could accommodate? I got my Tomini Tang yesterday from Divers Den at Live Aquaria. Everything went very well with the acclimation and putting the fish in the tang. There was absolutely no aggression whatsoever from any of my livestock, including my yellow tang. The Tomini went straight into the rockwork and hid. Later, I saw it found a cave for itself right near the cave my yellow tang resides in. Lights went out for the night. All was well. Today, the Tomini ventured out of hiding. It swam very cautiously through some of the tank. I fed the tank both Spectrum Thera-A pellets in and Spirulina Flakes. When the pellets when in the morning, the tang was in it's cave, so I am sure she did not get any. I fed the Spirulina flakes in the afternoon, when it was out in the open. The minute the flakes went in and the other fish started zooming about, the Tomini got scared and zoomed to the cave she had established (she's there now). I am writing because she is thin, and I was actually quite concerned about how thin she actually is - both body wise and behind the head. My service guy for the tank checked her over before she went in after she was drip acclimated, and agreed she was definitely thin, but not any more thin than many fish get after the stress of being in holding tanks and shipping. He said fish often go a couple of weeks without eating in these instances. but wanted to run it by you. The good news is that no one is harassing her, causing undo stress, and she was out for a period of time today (picked a bit at the live rock), which I felt were good signs. 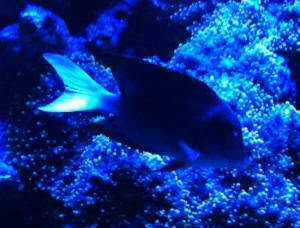 I know this is really hard to see, but attached is a picture of the new Tomini Tang. Again, for the first full day in the tank, I thought being out in the open like this for a bit was encouraging. I am hoping you can see what I mean about the weight of the fish and behind the head area. Thanks for the input. Tomini out today, under caves, but out. He ate Cyclop-eeze and some Spirulina flakes this morning. Seems quite hungry, picking on rocks, so he is not "off feed" in the tank, which is very encouraging. No one bothering him. I think with time, fish will be bolder, and things should go in a positive direction. I'll feel much better when/if he takes some Spectrum pellets. That will really cinch the deal for me. I am just curious about your thoughts on Divers Den at Live Aquaria shipping me an obviously emaciated fish. What is that about? I thought the entire point of using them was to get a healthy specimen, and, in my opinion an emaciated specimen does not exactly fall into this category. I would have certainly stayed away from it in a LFS, so this just surprised me. At any rate, I do think things will work out here.